Halkidiki holidays offer an exciting Greek holiday nestled on a three point peninsula which stretches out into the Aegean Sea. It’s the ideal place to get away from it all, with goats and mules for company, rather than hordes of tourists. Halkidiki is perfect for couples seeking a romantic getaway and families looking for some fun in the sun. With some of the best beaches in Greece, you will be spoilt for choice as to which golden sands to sample first. There are unspoilt sands, Blue Flag expanses, secret coves, and hidden gems along the 300-miles of coastline edged with warm, azure waters. Kassandra is at the western-most point, or the authentic Greek town of Ouranoupolis with its quaint central square and evening markets. 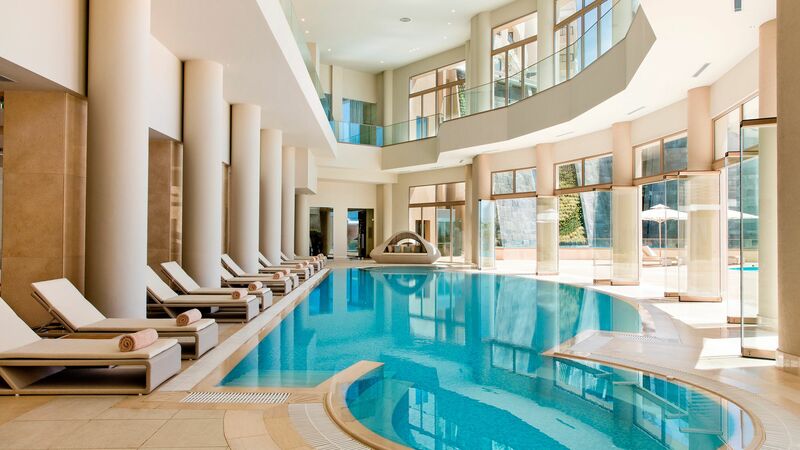 You could also head to the Sani resort where you will enjoy over 1000-acres of sandy beach. Outside of the towns is a beautiful countryside made up of olive groves and pine forests trailing down to powder soft sands below. There are also traditional Greek tavernas dotted over the island, featuring authentic Meze dishes, as well as freshly caught seafood. Up and coming Halkidiki offers a slice of Greek luxury to its holidaymakers, and a true sense of tradition and insight into Greek history. Sithonia presents a rugged and authentic side of Greece, sprinkled with charming fishing villages and picturesque pine forests. A luxury holiday in Halkidiki provides the perfect opportunity to experience Greece’s beautiful nature and wildlife in magnificent surroundings. There are plenty of walking and cycling trails along the coast, zig zagging inland, while beside the sea you will discover secret coves and hidden bays, which are footprint-free. 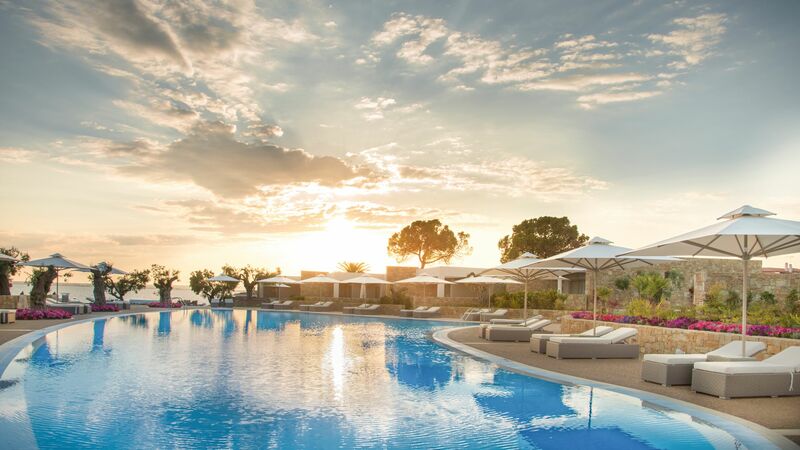 The sophisticated 1000-acre Sani resort offers deluxe accommodation with excellent facilities and stunning décor. Bordered by a golden Blue Flag beach, and swanky marina filled with priceless yachts, the resort also affords exceptional panoramic views out to Mount Olympus. The third peninsula is Mount Athos, which is home to Byzantine monasteries and well-preserved beaches. Access is via boat and very limited, ensuring you can escape the crowds. Wherever you choose to stay, rest assured that Sovereign will tailor-make you a deluxe holiday package to match your requirements with flights, accommodation, private transfers, and any special requests taken care of, so that you can concentrate on making holiday plans. Meteora means 'suspended in the air' and the monasteries here look like they're living up to their name. They top naturally formed rock pillars, which rise high above the countryside south-west of Thessaloniki. Byzantine paintings are the highlight inside the monasteries, while outside it's the views over the otherworldly landscape that keep cameras clicking. It’s worth taking a full day to explore Meteora – it’ll give you time to dip into the mountains, gorges and rivers of the bordering national parks. The slopes of Halkidiki's eastern peninsula are decorated with 20 odd monasteries that form UNESCO-listed Mount Athos. Visitors need a licence to get in, and women and children aren't allowed at all, so skip all the paperwork and view the centuries-old monasteries the relaxing way – by boat. You’ll also get views across the islands of Halkidiki, including Ammouliani. Some boats stop off here for an hour or so, giving you the chance to explore its bright gold sands. This west side of the peninsula is also dolphin territory, so it’s not uncommon to get a tag-along pod shadowing the boat on the way back. The vast port city of Thessaloniki is about 90 minutes' drive from Halkidiki. It’s almost as grand as the Greek capital, Athens – and much more approachable. It's got stacks of shops, museums and restaurants, plus the old town is a tangle of winding lanes, traditional houses and Byzantine churches made for wandering. The White Tower is the most recognisable monument – an Ottoman tower topped with a terrace that gives out spectacular views over the city and coastline. It’s also home to the Byzantine Museum of Thessaloniki, which stars a glittering collection of mosaics and paintings. Kassandra’s beaches and villages are the most sought-after spots in Halkidiki. A Roman canal slices the peninsula from mainland Greece – and that’s just a taster of its 700,000-year-long history. Ouranoupolis is the gateway to Mount Athos – a sacred peninsula for Orthodox pilgrims. The village itself lays out sandy beaches, a working fishing harbour and a pirate tower. Sani is a luxe resort and nature reserve on the north-west coast of the Kassandra peninsula. It rolls out 1,000 acres of sand-side beach clubs, sea-view swimming pools and stylish forest suites. Sithonia is a long peninsula, so you get a double helping of coastlines – along with sandy beaches, polished ports and windmill-topped bays. An often forgotten Greek Island, family holidays in Halkidiki offer a chance to unwind and enjoy the famous Greek cuisine and hospitality without worrying about crowds. Spend your days on the warm sands of the beach, listening to the waves lapping at the beach or make the most of the many water sports on offer here. Flight time from the UK to Halkidiki is around 3 hours. May to September is Halkidiki’s main beach-going season. Temperatures hover in the comfortable early- to mid-20s throughout the shoulder months (May and September), which are often good for fewer crowds and quieter hotels. Things start heating up in July and August, when the temperature can get into the early 30s. Cuisine in Halkidiki is based around fresh local produce, seasonality and simple preparation to let natural flavours shine though. Expect plenty of colourful raw vegetables, wine, olive oil and meat. Look for traditional tavernas to taste some typical dishes – mezes is a good way to get started. A mix of small dishes, mezes are a traditional accompaniment to evening drinks (tsipouro is the strong local tipple, if you’re feeling brave) and include dishes like halloumi cheese, falafel, hummus and baba ghanoush. Halkidiki is fantastic is you're looking for a beach holiday with added culture. Whether it's heading into the city of Thessaloniki for the day, taking a boat trip to view the monastery at Mount Athos, or shopping at Nea Moudania's market, there are lots of ways to experience a taste of authentic Greece.